The Ozone is celebrating the 6th Annual ReNEW show! 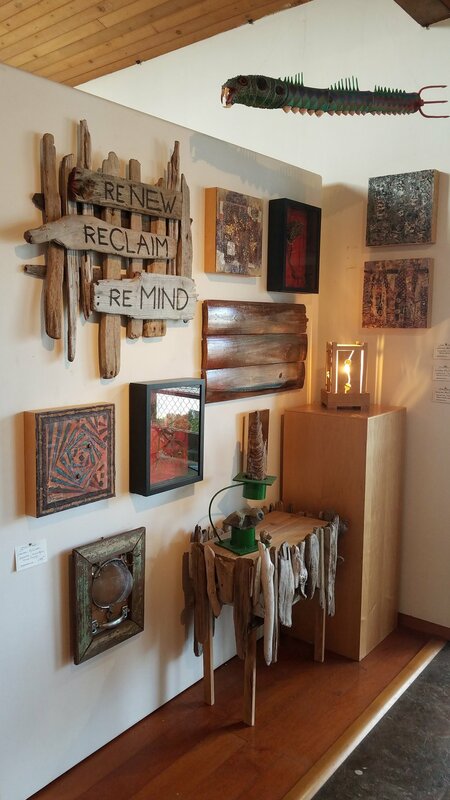 Local artists go to edges of creativity to upcycle and re-use found objects, woods and substrates that have history before becoming art in all sorts of surprising ways. This show is also about the environment, reminding us of its beauty and how we impact it. At the front door, a great blend of artist's visions awaits. From reclaimed panels to compositions of 'lost and founds', the phrase that comes to mind is 'how did they ever think of that?'. 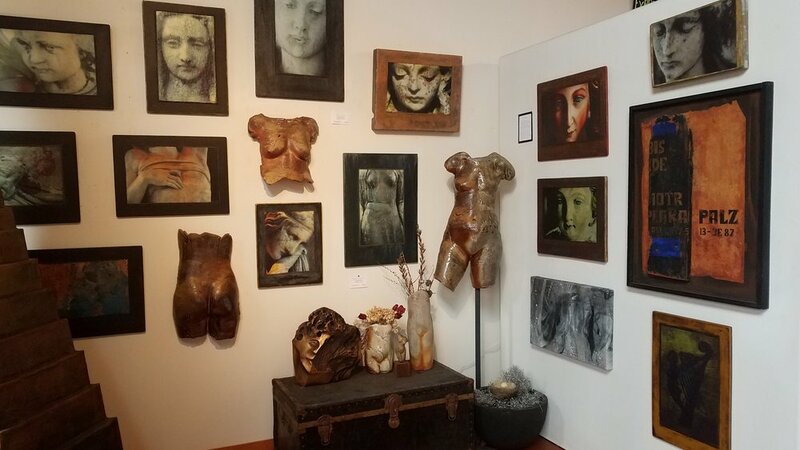 Paintings, sculpture, and even jewelry are all part of the theme. Expressing the way we feel about the environment comes in many voices. Conveying those feelings comes in as many different packages. Classical oil landscapes from Michael Guerriero are contrasted by unique ReMIND-scapes by Mark Yanowski, Karen Britt, and Jonny Omnibus. Sign our Guest Book at the pedestal with your own expressions of doodles, comments and whatever you'd like to add. Robert West found these French Doors at the Habitat for Humanity Restore. To him, doors with their windows busted out was a 'no brainer'...one man's mistake, another man's inspiration. 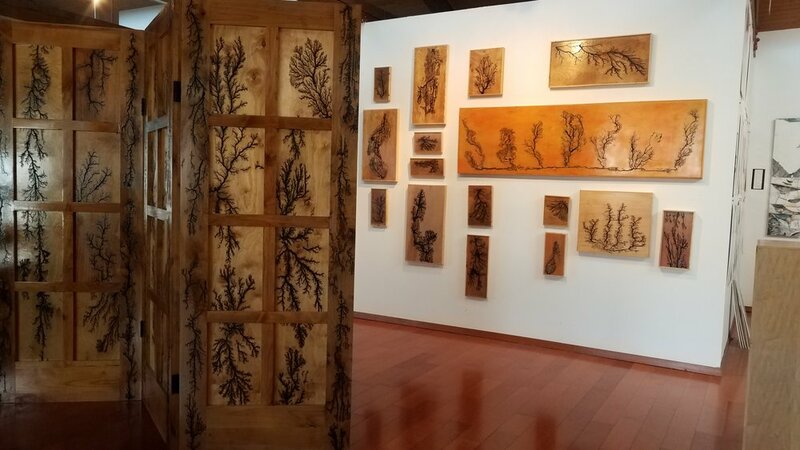 Not only did Robert 'burn' the Electric Trees into the panes, but also the doors themselves, then attached them together to make an incredible room divider. They still can be separated to use as normal doors and what don't you love about art you can use?! Our 'body of work' in the world is a big part of 'ReMIND'. Like the butterfly effect, how we move, moves the world. In Laura Aldridge's found wood panels layered with haunting images, yards of antique textiles and textures are powerfully sentimental. Mark Terry's Goddess series in ceramic celebrates the body and it's own topography, terrain, and environment. On the left, Aurora Pope paints like an archaeologist. She builds complex scenes burying rewards for the viewer for discoveries like a dig in a sacred place. Susan Farnham (right) paints in such interesting rhythms, you can almost hear her work. Found objects, Oregon Walnut Oils, and upcycled newspaper printing plates are important instruments in this symphony.